Subject description: 22.01.2017 - New iso image uploaded. Edit: 18.01.2017 - New XenialDog iso image uploaded. 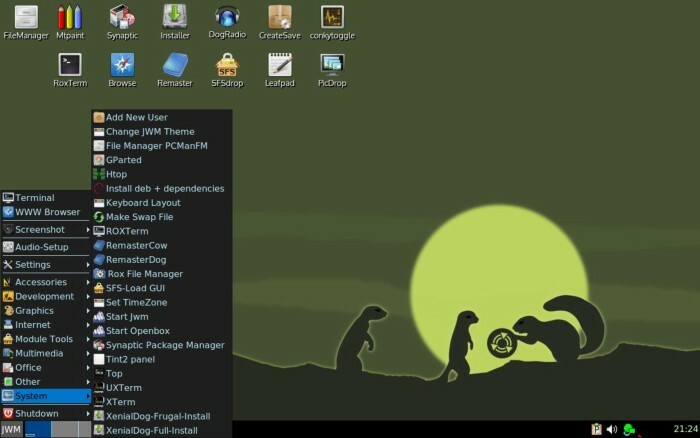 Very similar to DebianDog, but with the difference that it's Ubuntu based, so can be compared best with Mintpup, as Mintpup is based on Ubuntu also. Tint2 bottom panel or cairo-dock. Special thanks to Toni (saintless), William (mcewanw), Terry (sunburnt) and all who helped by giving feedback on the DebianDog and Mintpup threads. 2.) Bug fix for RemasterDog (script to remaster) (copy progress bar didn't show). Everything seems fine so far. Will add to this post if I find or do anything interesting. 1. *.desktop file is missing for rox-filer, but it works from terminal. 2. Can't figure out how to put items on desktop. Won't drag and drop like rox. Putting links in /root/Desktop like in Debian Dog doesn't work. No "send to" right click choice like Debian Dog. Am I just missing something simple here? 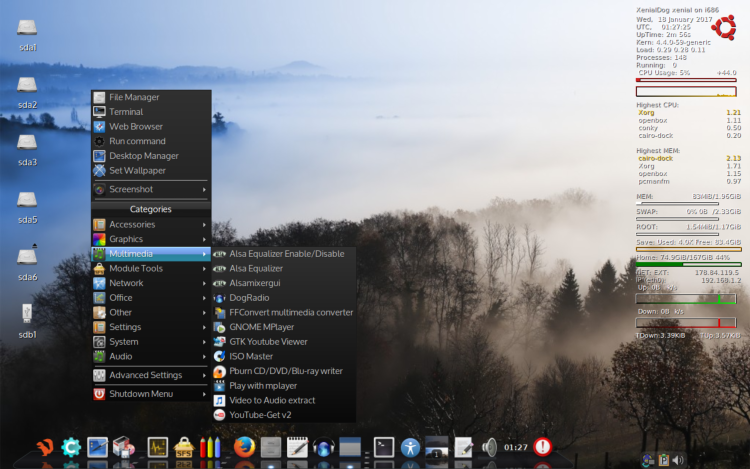 edit again: Found the desktop manager and switched to rox pinboard, so I know how to put items on desktop now. NIce. Hopefully Toni will help out on this one too since 32bit, and he can maybe suggest how to cut the size down a bit since we all know he is good at that.EDIT: Just noticed it comes with Python installed (as well as Perl) so that does account to some extent for initial size and it is becoming difficult to avoid Python being installed sooner or later anyway I've found (becoming a common dependency). I'll certainly give it a run though I'm sticking with DD64 for the most part just now because I'm trying to get used to 64bit system in the sense of the issues that arise when we need to run 32bit software on it sometimes. Could not find Wlan connection with Frisbee . Ethernet controller	Realtek Semiconductor Co., Ltd. RTL-8100/8101L/8139 PCI Fast Ethernet Adapter (rev 10). Download seem to be impossible. Yes, download from link in first post, kept failing. However, following many restarts, the .iso file was downloaded successfully. MD5Sum was checked and correct. I'm curious if you have the same sudo issues with this one as you reported earlier with DebianDog. Well, it is in the Menu (System > Rox Filemanager) but not in /usr/share/applications, can't remember why, I put it in /usr/local/share/applications. You mean you could not connect? For example wired connection name "eth0" has changed to "ens1"
And wlan0 has changed to something like wlp??? Add to your kernel boot line (after reboot the change will apply): "
I beg you please ...where exactly to place this line at the kernel boot line ?